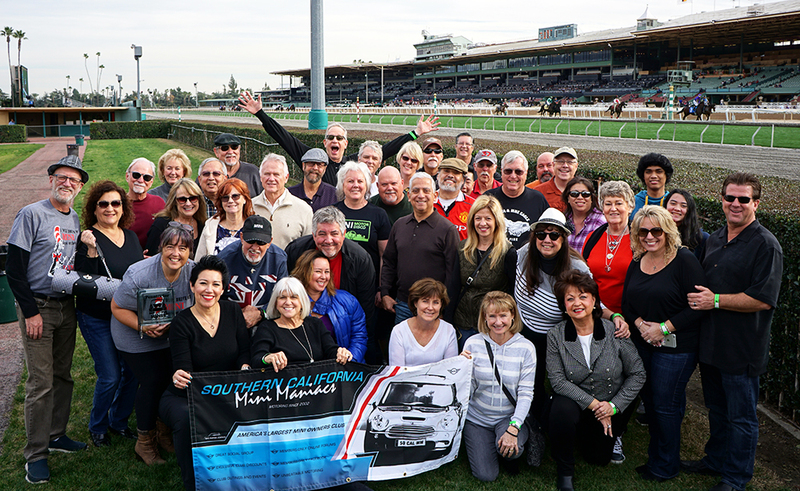 SCMM members celebrated the club’s 16th anniversary on January 20, with a day of thoroughbred horse racing action. The gathering at Santa Anita Park, an annual tradition since the beginning days of the club, included a delicious buffet lunch, the always popular raffle drawing and the debut of one extraordinary filly. Each year SCMM gets mentioned in the program with a named race, and this year the very special fifth race belonged to SCMM. Special because of a certain 3-year-old filly, Flor de La Mar, was making its much-anticipated debut. Special because the filly’s trainer is legendary Bob Baffert, who trained the 2015 Triple Crown winner American Pharoah and 2018 Triple Crown winner Justify. Baffert’s resume also includes five Kentucky Derby wins, seven Preakness Stakes, and three Belmont Stake among the long list of winners to his name. 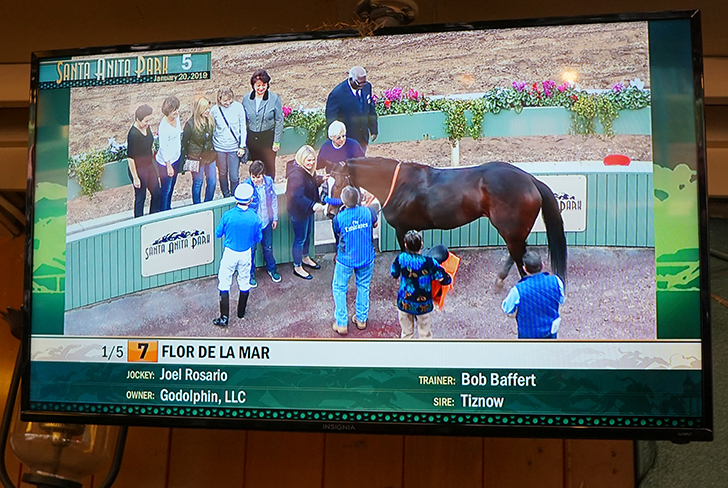 As expected, Flor de La Mar did not disappoint, beating the second place horse by five lengths, and sending five lucky SCMM members to the winner’s circle for what will no doubt become a very historic photo of a rising star in horse racing. Because the race was named for SCMM, the club got to send five members to the winner’s circle for the victory photo. So joining Flor de La Mar in the photo was jockey Joel Rosario, trainer Bob Baffert, and SCMM members Cecilia Williams, Carmen Urenda, San Slawson, Kyra Marsh and Sandy Reaume. SCMM members Cecilia Williams, Carmen Urenda, San Slawson, Kyra Marsh and Sandy Reaume in the Winner’s Circle for a photo with Flor de La Mar, jockey Joel Rosario and trainer Bob Baffert. 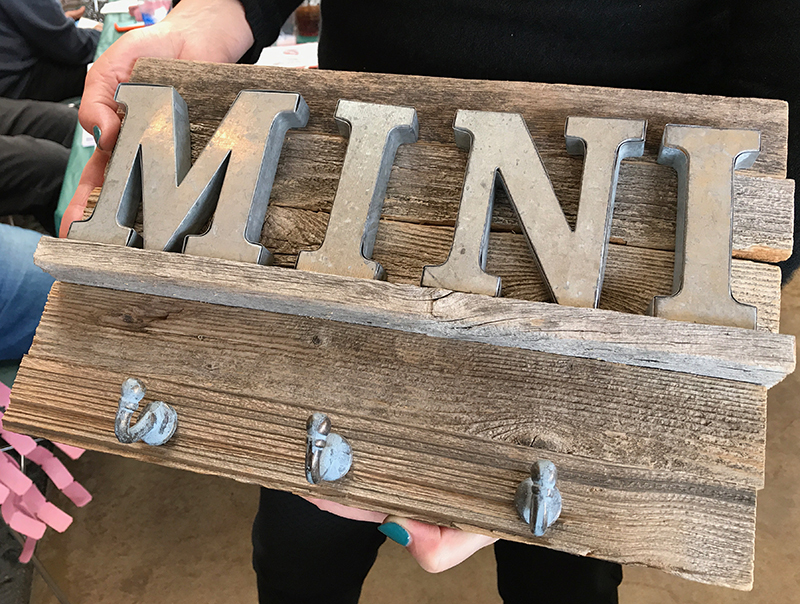 One of the raffle prizes given away was this uniquely beautiful MINI key rack, handcrafted by Craig and Joanie Berkwitz. When the horses weren’t racing, SCMM members were winning raffle prizes, donated by the club and its officers. They included two GoPro type action cameras, a Garmin GPS, three MINI car covers, bluetooth speaker, digital camera, T-shrts, die cast MINIs, wine, oil changes from Motoring Magic, a MINI cooler, tools, and some very unique glass block penny jars and MINI themed key rack, expertly handcrafted by Craig and Joanie Berkwitz.